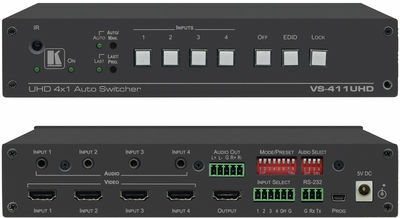 The Kramer VS-411UHD is an automatic switcher for 4K@60Hz (4:2:0) HDMI and analogue audio signals. 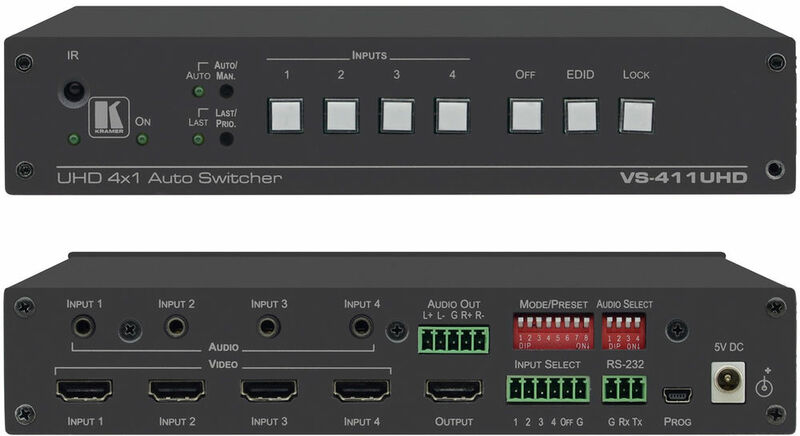 VS-411UHD automatically switches one of four HDMI inputs to a predefined or last connected input whenever the currently active video signal is interrupted or whenever a higher-priority video signal is detected. They also support Kramer's Step-in over HDMI technology. Max. Data Rate - 8.91Gbps (2.97Gbps per graphic channel). Active Switching - Selectable manual or fast auto switching according to last connected or preset priority. Compliance - HDMI 1.4, HDCP and DVI 1.0. HDMI 1.4 Support - Deep Colour, 3D, up to 7.1 uncompressed audio channels, ARC (supported on Input 1 only). HDMI ARC De-embedding - From output to balanced stereo audio line, uncompressed. Automatic Video Input Detection & Selection. Auto Power Off - When no HDMI input for 10 seconds (selectable). Stereo Analogue Audio Input Per Port. Firmware Upgrade - Over RS-232, mini-USB. Software Support - Protocol 3000, EDID Designer, K-Upload via RS-232. Varied Control Options - Front panel buttons, contact closure, IR, RS-232 Protocol 3000. Product Weight 0.9kg (2.0lbs) approx. Shipping Weight 1.5kg (3.3lbs) approx.